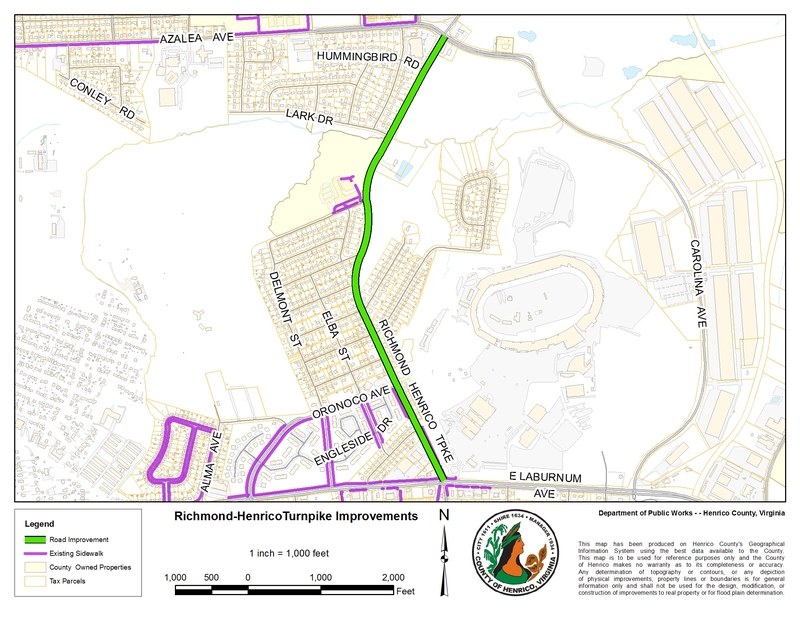 The County of Henrico will be widening Richmond-Henrico Turnpike from the intersection of Laburnum Avenue to approximately 0.7 miles north of Azalea Avenue from 2 lanes to 4 lanes with sidewalks, shared use path, and signal upgrades. The project will widen Richmond-Henrico Turnpike from the intersection of Laburnum Avenue north to the Buckingham Branch RR, located approximately 0.7 miles north of Azalea Avenue. The existing 2-lane, undivided roadway will be improved to a four-lane, divided roadway with a 16-foot raised median. A sidewalk will be constructed along the west side of Richmond-Henrico Turnpike and a shared-use path will be added along the east side. These pedestrian and bicycle amenities will provide direct access to Laburnum Elementary School and enhanced access to Henrico High School The project also includes replacement of an existing box culvert in poor condition, south of Lark Drive.